Hi, I have a severe problem with ants in my back yard, it looks the surface of the moon. I'd really like them to move on. Can anyone suggest a good natural pesticide or perhaps something I could spray to get them to go away? 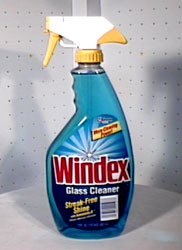 I've heard Windex works! I'm not sure it actually does, but it's worth a try, yeah? Dunno if you have Windex there, though. Window cleaner stuff. I hate ants! Good luck with that! Hey thanks Ill try that.Hmmm now sounds familiar to a cure all remedy I heard about in a movie call my greek wedding. Yes spot on girl. I think it was used to help ease a burn on the arm, perhaps I should try it?, although I was once told that if your in a paddock and a bull charges at you the best thing to do is lay down infront of it just before it reaches you and it will jump over you....Yeh right. Try Turmeric powder it really works but a little messy. I have quite a large back yard, should I spread it all over or just on the hundred or so mounds?